Beloved wine professor Patrick “Chip” Cassidy ’75 is the recipient of the 2014 President’s Council Worlds Ahead Award. Cassidy was recognized by his peers Oct. 2 at the annual Faculty Convocation and Awards Ceremony at Wertheim Performing Arts Center. 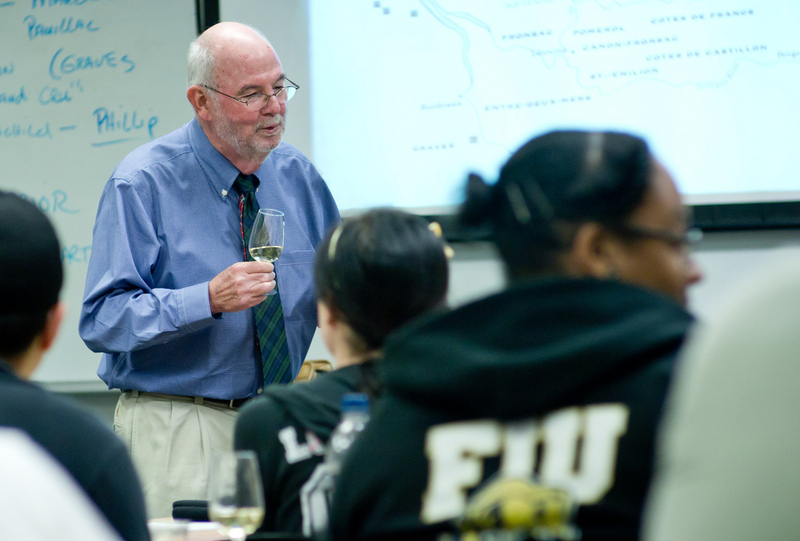 For 40 years, Cassidy has taught FIU students and customers everything there is to know about wine. His classes include wine technology and the business of wine. Recently he developed a wine certificate program offered to professionals already working in the wine industry or related fields. A noted speaker and fundraiser, he was instrumental in developing the concept to build the Southern Wine and Spirits Beverage Management Center, a state of the art wine teaching laboratory at Biscayne Bay Campus. Cassidy’ has led FIU’s wine program at the Chaplin School of Hospitality Management since he began teaching in 1984. Since then, he has mentored students who have gone on to Napa Valley as experts in the field. Former students call for advice and current students rave about his passion. “The best professor ever!!! Very passionate, very knowledgeable, and helps all his students – even after graduation. Must take class!,” said one student on Rateyourprofessor.com. In 1997, Cassidy helped launch an FIU food and wine festival with Southern Wine & Spirits. The event is now the internationally renown Food Network & Cooking Channel South Beach Wine & Food Festival presented by FOOD & WINE. During the convocation ceremony, 24 faculty members were recognized for achieving excellence in the areas of teaching, research, service, engagement, librarianship, mentoring and advising. As the President’s Council Worlds Ahead Award recipient, Cassidy will receive $12,500. Finalists Thomas Breslin and Ediberto Roman will each receive $2,000.